Everything from the number of weapon types, to the galactic economy has been tweaked in Mass Effect 3 to give the player more options. 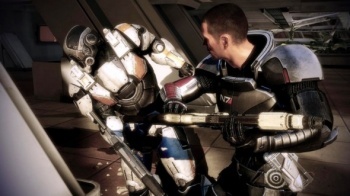 RPG fans have welcomed the return of weapons mods to the Mass Effect series with open arms, but according to executive producer Casey Hudson, Mass Effect 3's mods aren't just about making Shepard a more effective combatant, they're about allowing the player choose how he or she approaches a fight. Hudson said that while the first Mass Effect had a weapon customization, it never felt as "real" as it could have done, and there weren't enough interesting choices to make. For Mass Effect 3, BioWare has added lots of new weapons, and lots of new modification types, and has also changed the way that the game's economy works to accommodate the extra depth in the mechanics. BioWare's goal, Hudson explained, was to give players the means to customize the game to suit their individual play style. Even though numbers and statistics aren't really what add the RP to the G, if it's a choice between having them and not, plenty of RPG fans - myself included - will take option A every time. A lot of people missed having that mechanical depth in Mass Effect 2 and now it sounds like it's back with a vengeance.